Our present philosophical position might be described – as Kenneth Kierans did in his article – as ‘beyond deconstruction’ (KIERANS, 1997). He pointed to the critical reaction on the philosophical thoughts of Jacques Derrida and Paul de Man by writers such as David LEHMAN (1991) and Geoffrey HARTMAN (1980; 1991), mainly on the grounds of the arbitrariness of their chosen subjects. ‘Deconstruction, it is argued, stands outside of reason and affirms only an endless, undisciplined, even wild freedom of commentary’ (LEHMAN, 1991). The (literary) critic is certain of himself alone and determined to undermine every specific claim of truth within the text. This critique of ‘arbitrariness’ is severe on any pioneer in a given (scientific) field. The possibility of subjective choices is pack and parcel of any road to discovery, and not only the deconstructive one. Kierans pointed also to ‘a rediscovery of traditional philosophical ideas, and a reaffirmation of their truth, even if in one respect in a distorted way.’ In particular Hegel’s opinion that ideas are not external things, but are built in the concept itself, is part of that rediscovery. The quadralectic view of a subdivision of the Second Quadrant (as the birthplace of the ‘idea’) into the stages of the main (four-fold) division reflects this same vision. ‘Beyond deconstruction’ must not get stuck in the specific characteristics of intuition, consciousness, and/or the nature of ‘ideas’, but has to focus on the arbitrariness of the division itself. There is no point in attacking dualistic (or oppositional) thinking, which seemed to be the backbone of the deconstruction method. Paul de Man – in his pioneering book ‘Allegories of Reading’ (1979) – was doing just that: breaking the figural language of Rousseau, Nietzsche, Rilke and Proust into pieces that fit into a theory of reading. This theory found its inspiration in the (classical) rhetorics. De Man (1979) pointed to Nietzsche and his outlines for a ‘Course on Rhetoric’ (given in the winter semester 1872-73, with no more than two students present). The German philosopher made a distinction between rhetorics as a system of tropes and one based on the skills of persuasion (Beredsamkeit). The two variables represent different points of view: ‘Considered as persuasion, rhetoric is performative but when considered as a system of tropes, it deconstructs its own performance’ (p. 131). The tropos (as figures of speech) and the persuasion represent, in a quadralectic view, the ‘objectivity’ of division and the ‘subjectivity’ of movement in a communication. The basic dualistic entities exist together, and at the same time. Therefore, the ‘escape’ in rhetorics can only be partially (in words on a technical level) and temporary (in things on an interpretative level). The cross-shaped reversal of properties – known to rhetoricians as chiasmus – does not offer a solution either (to the ultimate problem of unity in a communication). The name chiasmus is derived from the Greek letter chi (x) and indicates a ‘criss-cross’ arrangement of terms. The attributes of word and things can be reversed as a figure of speech to enrich a communication. The figure was common in eighteenth-century English poetry and a determining figure in the verses of Rainer Maria Rilke (1875 – 1926). The expression is a powerful oratorical tool. The American President John F. Kennedy (1917 – 1963) used the chiasmus as a rhetorical device in his well-known: ‘Ask not what your country can do for you, ask what you can do for your country’. The parallel structure and the inversion are a reminder of the creation of the quadralectic CF-graph. This graph was the result of a shift between two four divisions and included an inversion of directions. The actual power of a chiastic expression might find its very origin in this resemblance, combined with the force of a ‘double’ dialectic. Quadralectic thinking can be ‘deconstructed’ too. The description of the quadrants – in terms of a certain kind of visibility – is a generalization of the multitude of CF-values in a given quadrant. This aspect is strikingly evident in the Third Quadrant, which constitutes for the majority of CF-values above the visibility boundary (CF = 11) and is still characterized as the area of maximum (visible) visibility. It points, on the one hand, to the most ‘material’ side of a communication, but this physical appearance is, on the other hand, the least visible. The ‘meaning’ of CF-values – other than as an indication of distance between communication partners – can always be questioned (including the definition of visible visibility itself). The actual arithmetical procedure, which led to the formation of the CF-graph, cannot be deconstructed. All directions of the shift (between the divisions) and the valuation thereof are incorporated in a formal mathematical process. Its logic outcome is ‘immune’ for further questioning. The ‘language’ of mathematics (with its roots in the First Quadrant) overrules here the ‘language’ of deconstruction (with its home ground in the Fourth Quadrant). The mathematical mind can see the infinity of the invisible (as indivisibility), while deconstructional reasoning always needs the visible to express itself (in a division environment). Quadralectic thinking agrees with Husserl’s idea of a discrepancy between an original intuition (set in a First Quadrant, characterized by the perception of a ‘preliminary presence’) and the intentions of consciousness (running its course through the other quadrants). His conclusion that there can be no reconciliation between our intuition and the free act of consciousness will not be followed. There is no real rift between the First and Second Quadrant. Intuition can cross into the other quadrants, and consciousness is not excluded from the First Quadrant. The only possible gap in quadralectic thinking might be found between the proposed Fourth and the following First Quadrant. The infinite depth (or the Abyss) is created in a projection of oppositional thinking on a cyclic four-division. The biological idea of an operational effectiveness in our interaction with the world has to be included in a quadralectic vision. Humberto Maturana pioneered this particular type of ‘system thinking’. He focused on a model of cognition that explains knowledge as the product of a closed circuit of internal operations (von GLASERSFELD, 1997). ‘Constructivism’ or ‘co-inspiration’ can replace the confusing dualistic term of ‘objectivity’. These substitutes suggest a wider division environment, which includes – in its most complete form – all the stages of construction as given in the last chapter. Even then, one has to be more precise (then the pragmatists and the constructivists) in the actual valuation of the terms ‘functioning’ and ‘effectiveness’. The ability to play is encouraged, but someone has to know the rules. Even if the source of relativistic knowledge originates in the observer-self, then there is still a need for a measurement of its flow (if visibility will ever becomes meaningful). How do we measure effectiveness? The answer can be found in the quadralectic feature of the communication graph. This graph follows the position of an observer in terms of intensio (approach) and remissio (alienation). A certain point (of view) – in the communication and on the graph – is expressed as a number (CF-value), which indicates the ‘effectiveness’ of an observer to interact. The actual ‘progress’ of quadralectic thinking over such ‘Fourth Quadrant’ products as phenomenology, deconstruction and constructivism is experienced in the very presence of an arithmetical measuring system, which keeps the relativistic forces at bay. The skeptical mind – as yet another classical product of Fourth Quadrant thinking – meets with its last point of reference in the knowledge of scale, setting the rules for the interaction. The introduction of das Geviert (the four-fold), in the later works of Martin Heidegger (Vorträge und Aufsätze, 1954), pointed to the interplay of heaven and earth, the holy and the mortal. He saw these four entities as the main constituencies in the creation of space and Being. His visualization of the four-fold, as a meeting place for man and nature, is a strong reminder to the picture of the ‘art of dying’ in Girolamo Savonarola’s book ‘Predica dell’arte del bene morire’ (fig. 93). This woodcut – shaped at the Pivotal Point of the European cultural history (1500) – has exactly the components, which Heidegger saw as the ‘world’ (das bauende Hervorbringen). Fig. 93 – A representation of the ‘Art of Dying’ in Savonarola’s book ‘Predica dell’arte del bene morire’ (Florence, 1504). The two-division of life and death is superimposed on a four-division of heaven and earth. These elements resurfaced in the later works of the German philosopher Martin Heidegger (1889 – 1976) and his ideas of ‘das Geviert’ (the four-fold). The oppositional pairs of heaven-earth and holy-mortal represent the basic qualities of any communication in place and time (being the operational disguises as division and movement). Heidegger’s Geviert has, although covered in a blanket of hard-to-under-stand terms (‘penetrating the thickets of Heidegger’s terminological jungle’), a strong analogy with Savonarola’s early sixteenth century ‘art of dying’. Both renderings try to construct, despite a time gap of four hundred and fifty years, a ‘monument of life’, which can surpass the human black-and-white setting of life and death. God sits in heaven, in a circle of clouds. The blessing figure, surrounded by nine angels (the muses?) amidst stars, is framed in a mandorla with four angels. This holy place bears all the characteristics of the First Quadrant, the invisible invisibility of the quadralectic mind. The holy circle shines its light into a rather empty sky. Only two angels populate this part of the picture, floating on a cloud. Their gestures indicate an invitation to the mortals below. The symmetry of the figures is probably a reference to the First Division, in this case a two-division. They form, together with God in heaven, a trinity in quasu (up there, in heaven). The invisible visibility of the division-environment is characteristic for the Second Quadrant. The dualism of Life and Death reaches its zenith in the world of the mortal. The richly dressed nobleman, with his purse strapped to his belt, has an encounter with Death. The man tries to plea his innocence, but death is merciless pointing to heaven. It is time to leave the quagui. Two devils are ready to assist the departure of this earth. 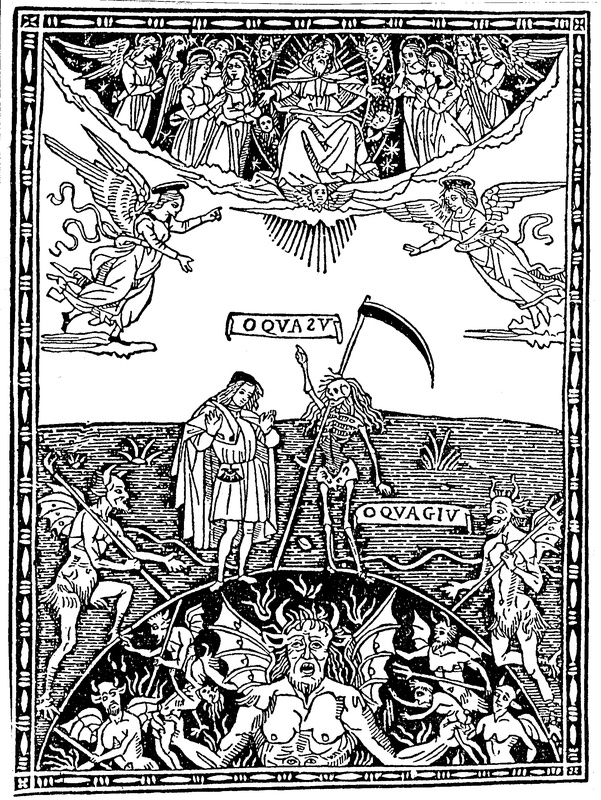 They form, together with the mortal and the death, a curious quaternity in quagiu (down there, on earth/underworld). The visible visibility of the Third Quadrant is a place of limitations. The sad cry of victory by a troubled Lucifer, roaring in the half-circle of the earth, represents the opposite face (of power) in the lower quarter of the picture. Four devils surround the Devil, while he is crushing two unlucky mortals. It seems as if there is no mercy in this place of darkness. A comparison with the visible invisibility of the quadralectic Fourth Quadrant might be appropriate here (a quantity), but it should be noted, that the emphasis is on the oppositional aspects. This is the place to draw the final conclusions of the quadralectic approach. We have seen its dispositio, the arrangement of the revived four-fold way of thinking. The theoretical part (pp. 90 – 117) launched a shift between two four-divisions. The calculations ended, after the elimination of hierarchy and direction, in a value-system based on a virtual distance between the communication partners. Then, with the preliminary result of the theoretical reconstruction at hand, it was possible to build a new observation point. Past and future could be seen in a broader sense, in which objectivity and subjectivity participate at the same time (or were both absent). The European history showed a familiar trend along different types of division thinking, just like other cultures (like the Egyptian, Greek or Roman civilizations) had done before. And the position in the present begot a new meaning and held the promise of more. Our existence as a human being – in a magical Observational Present (OP) – is a matter of visibility, not only by ourselves, but also by the world as a whole and even the universe. That visibility is the result of a static division, and a dynamic movement derived from the same metaphysical stock as place and time. Our presence in life will greatly benefit from the understanding of observation by determining the forces, of which it constitutes. The quadralectic approach is just one possibility, but with a versatile profile: not too few and not too many. And it is also a system in equilibrium: the (oppositional) forces are kept at bay and power is neutralized. Furthermore, it is a peaceful system as well, aiming at the possible understanding between man. Creating a personal identity should not be destructive for someone else. The quadralectic vision has witnessed the birth of the Asymptotic Man. Every visibility (or invisibility) is the result of the choice of a certain static division and an arbitrary point of reference in a dynamic environment. The position in a self-selected present can be visualized on an asymptotic graph. The horizontal axis gives the length of communication (as part of a division, which determines a temporal-objective place) and a vertical axis marks the beginning of communication (as part of a movement, which provides the topical-subjective time). We know now where we are and have the means to pinpoint our position. What remains (after the position is fixed) is a further increase in the knowledge of scale. The appropriate parameters are changing all the time: distances seem to come near, and the present is running away from us. The action can be the other way around, when near is far and the moment is now. A modern observer knows that the actual direction is not important, but the intensity of the experience is. The wisdom and truth of the Asymptotic Man, floating through the apparent opposition of the quasu and quagiu, is recapitulated in the knowledge that only the comparison in a proper division environment will hold the key to life. For that very reason, we have to travel on, looking for new experiences to calibrate the scale of our thinking. In the end, which is not really an end, there is that great feeling of understanding the scale of things and knowing our humble place as an observer. This book will end with four lines from the poem ‘Jerusalem’ (1804/1818) by William Blake (1757 – 1827). The British poet, engraver and visionary mystic composed the work from 1804 onwards, but the first complete copy only appeared in 1820. The work consists of four parts (addressed to different audiences – the Public, the Jews, the Deists, and the Christians) and comprises one hundred plates. There are only six known copies of the poem, of which one is colored. Blake’s Four-fold Man is, in his view, a man in his complete or unfallen state, when he is identical with God. All the four main faculties (the so-called ‘Zoas’) are functioning in an optimal way. ‘Emanation’ is the female representation of Nature, seen as a field of human creation. ‘Spectre’ points to the withdrawn subjective mind. ‘Shadow’ is the objective counterpart of the Spectre. Before me. O Divine Spirit, sustain me on thy wings.